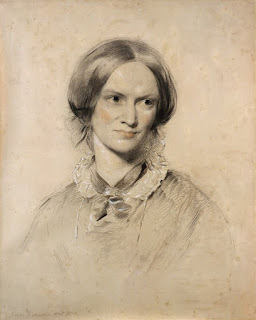 Charlotte Bronte, a woman determined to succeed, declared herself "a free human being with an independent will." She was born in the era of The Cult of Domesticity on the desolate moors of Yorkshire, the daughter of an Anglican clergyman. Charlotte and her sisters, and their brother, Branwell, grew up blighted by domestic tragedy and loss and had to create a world of imagination for themselves. Save for the Parsonage cemetery at their doorstep and monotonous hours exploring the windswept expanses of the moors they were led as teenagers on a path of creative Juveniiia that resulted in plays and hand-made miniature books, illustrated with watercolor images. For Charlotte and her sisters later it was Jane Eyre, Withering Heights, and Agnes Grey that gave the mid-nineteenth century a new concept of women in love and trying to live in society. Image Left: Life portrait of Charlotte Bronte, by George Richmond, on loan from London's National Portrait Gallery. 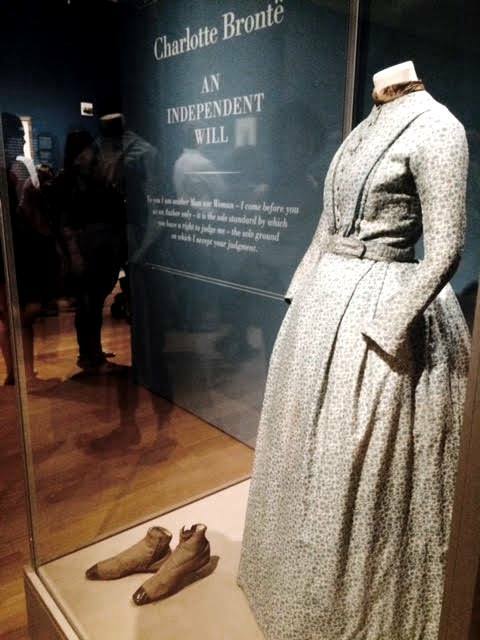 CHARLOTTE BRONTE: An Independent Will, a new exhibit at The Morgan Library & Museum runs through January 2, 2017. It traces the writer's life from imaginative teenager to reluctant governess to published poet and masterful novelist. The exhibition celebrates the two-hundredth anniversary of Bronte's birth in 1816, and marks an historic collaboration between The Morgan, which holds one of the word's most important collections of Bronte Manuscripts and letters, and the Bronte Parsonage, in Haworth, England which lent a variety of key items including the author's earliest manuscript, her portable writing desk and paintbox, and a blue floral dress she wore in the 1850s. 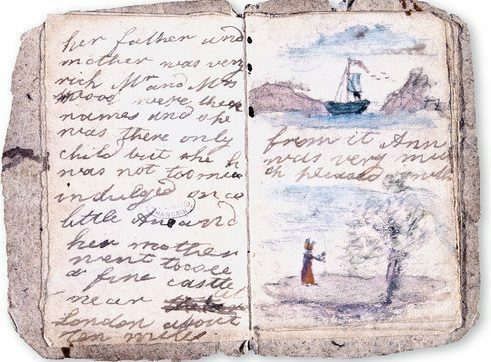 THE MINUSCULE BOOKS Reading of the classics, the bible and Milton, Scott, and Lord Byron to name a few, fueled the Bronte children's imagination and their games informed their writing, and enhanced their stories. The selection of Juvenilia presented in the exhibition highlights the whimsy and imaginativeness of the Brontes' production. On one view is Charlotte's earliest surviving manuscript, a tiny handmade booklet. I observed, it is no more than two and a half inches by one and a fourth inches illustrated with watercolor drawings. It presents the story of a little girl named Anne who goes on an exciting journey. Best to use the magnifying glass provided in the exhibit hall to try to see the almost indecipherable writing. Bronte wrote it when she was about twelve. 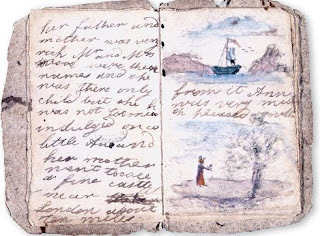 Image Right: Charlotte Bronte's story, beginning "There once was a little girl and her name was Anne ca 1828 Bronte Parsonage Museum. TEACHING and PUBLISHING: In 1836, when she was nineteen, Bronte entered the Roe Head School where she previously had been a student, as a teacher, but chafed in her new role. A few years later she took a a short-term position as a governess in a private home, caring for what she called the "riotous, perverse, unmanageable cubs." Relief came with the largess of an aunt. Bronte and her sister Emily went to Brussels in 1842 to study and improve their teaching credentials. It was there that she fell under the influence of her inspiring teacher, Constantin Heger and later suffered years of what appeared to be unrequited love for the married professor. As Bronte biographer Rebecca Fraser wrote, "Working as governesses, teaching school, traveling to the continent, and caring for their volatile and tragic brother, Branwell, Charlotte and her sisters led difficult and fiery lives---lives that electrified their fiction, challenged the Victorian Age, and made them the most distinctive, enduring women---and novelists--of their time." In 1846, she and her sisters Emily and Anne self-published a book of poems, which by the record sold but one copy, yet was held in esteem by some of her followers. Jane Eyre, Wuthering Heights. and Agnes Grey followed. The authors retained the pseudonyms they had chosen for their book of poems the year earlier. Charlotte was Currier Bell, Emily, Elias Bell and Anne, Acton Bell.